This brownie has everything! 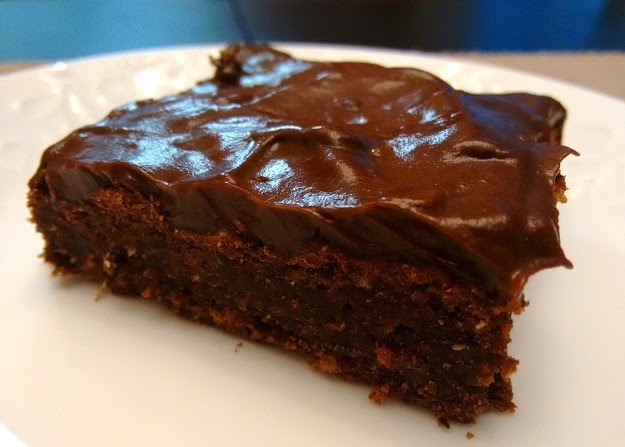 The recipe was adjusted from the cookbook, Out of the Pod, by Vicky Jones, and of course, it would not be complete with Chocolate Avocado Mousse for the icing. Toasted hazelnuts give this brownie a Nutella-like flavour, and black beans add a dose of fibre and protein. They are easy to make, since almost everything goes into the food processor or high-powered blender. To remove the skins from the hazelnuts, toast them at 300 degrees F, when they become fragrant (8-10 minutes), remove them from the oven and allow them to slightly cool. When they are cool enough to touch, place them inside a paper towel and rub them together until skins fall off. Preheat oven to 325 degrees F. Grease a 9x9 pan with canola spray. Mix whole wheat flour and salt in a large bowl. Set aside. In a food processor, combine black beans, cocoa, cinnamon, brown sugar, oil, vanilla and eggs. Blend until uniform in consistency (and a pudding-like thickness). Pour mixture into large bowl with flour. Fold mixture together, then add in ground hazelnuts. Pour mixture into greased pan and bake for approximately 38 minutes. Allow to cool before icing.